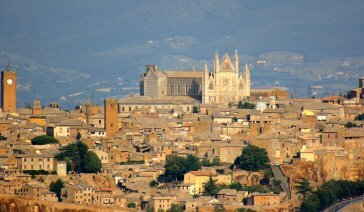 Orvieto is one of the Italian cities with a high density of monuments and things to see. A city that has evolved over the years due to the passage of different civilizations that have characterized much. In fact the city of Orvieto with Etruscan civilization experienced a period of great splendor and magnitude as to become the hub and the most important city of the vast territory of Etruria. Orvieto also met a Roman period marked by clashes very hard, the Romans destroyed the city to transfer much of the population at Volsinii (today Bolsena). A period of Papal State characterized by a great wealth and prosperity that lasted until 1348 year in which the plague epidemic and the continuing political infighting between the great noble families (especially the Monaldeschi and Filippeschi) put an end to the experience Orvieto as a free commune and city-states. 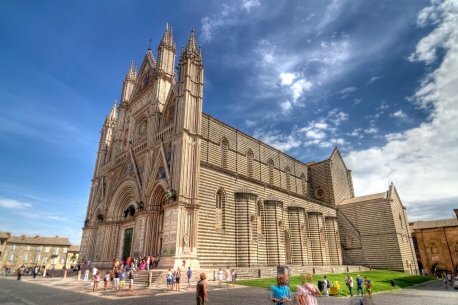 The Duomo of Orvieto is the cathedral church town, a masterpiece of Italian Gothic architecture. The facade is decorated by a large number of bas-reliefs and sculptures made by the Sienese Lorenzo Maitani. The Pozzo di San Patrizio (St. Patrick’s Well) is a structure built between 1527 and 1537, by Pope Clement VII. The work of the well designed to provide water in the event of a disaster or siege were concluded during the papacy of Paul III (1534-1549). Well took the name of Saint Patrick because he remembered the cave that existed in the place (in Ireland) that now bears the name of St. Patrick’s Purgatory.